Make 2019 The Year, Your Child Secures A1/ A Star for Their Tamil Papers. அற்புதமான வாய்ப்பு நமது பெற்றோர்களுக்கு, நழுவ விடாதீர்! Sigaram books certainly a comprehensive and all rounder compilation by Wordsmith Education Group! Created in the form of guide book and revision worksheets for paper 1 & 2, I trust this should be all that your child needs to score a distinction. Am pretty sure this would be a blessing to many Parents/Teachers as it contains all essential components necessary, based on our present primary school syllabus to uplift your child’s standard. Well done wordsmith and wishing you continued success! 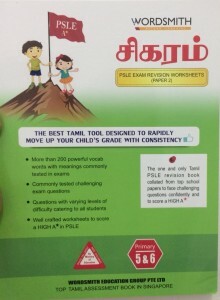 Sigaram books are best enhanced tool designed to fill the gap in the tamil assessment books available in the market. Many parents are frustrated for not getting the right assessment book in the market that improve the child’s grade up and to produce good results consistently. We have released the PSLE package and O level package which comes with guarantee to improve grades within short time. We are premier tamil tuition centre specialised exclusively in tamil language to provide quality primary and secondary students tamil coaching classes for consistent improvement in grades to next level within 3 months period.